New Zealand 443 and 3-35 (Peter Fulton 14*, Dean Brownlie 13*, Stuart Broad 2-7) lead England 204 (Matt Prior 73, Joe Root 45, Trent Boult 6-68) by 274 runs. The Black Caps hammered 443 runs in the first innings and managed 3-35 runs while consuming 23 overs in the second whereas England was bowled out for 204 runs in 89.2 overs. 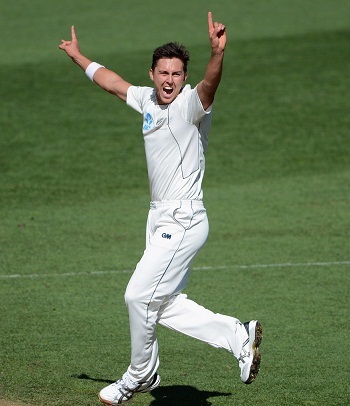 The third day’s play of the third Test concluded on Sunday, March 24, 2013, at Eden Park, Auckland. Earlier, England started off at 2-50 in 25 overs whereas Nick Compton and Ian Bell were at the crease on 12 and 6 runs respectively. Compton was declared leg before wicket off Tim Southee for 13 as the score touched 61 and Bell followed him four runs later at 17. The miseries for the tourists were multiplied when Jonny Bairstow became the next victim for just three runs and was replaced by Matt Prior. The duo tried to consolidate the innings with determination whereas the rival bowlers kept on bowling as per their line and length. The batsman found it hard to get the boundaries and the first hundred of the innings was displayed on board in the 57th over. Prior was dropped at 24 by Dean Brownlie at second slip off Southee on the third ball of the 62nd over and the batsman added 2 fours in the 66th over. He was the most attacking of the two and posted his 26th Test fifty in the 71st over with a couple of fours. Root kept on creeping from the other end as Prior was adding useful runs with regular boundaries and they took the score to 173. Matt Prior was gone after scoring 73 off 130 balls with 13 fours as Trent Boult ripped through the tail of the visitors in no time. Joe Root was the last batsman who was dismissed for 45 as the innings of England was rolled back for 204 in 89.2 overs. Trent Boult was unplayable throughout the innings and achieved his career’s best figures of 6-68 runs, Tim Southee held three whereas Neil Wagner claimed one wicket. New Zealand gained a mammoth first innings lead of 239 runs as the quick bowling pair of Stuart Broad and James Anderson destroyed the top order batting of the hosts. The Kiwis lost three wickets for eight mere runs in 8 overs that included the solid batsmen like Hamish Rutherford, Kane Williamson and Ross Taylor who were dismissed for 0, 1 and 3 runs. Dean Brownlie joined in with Peter Fulton and they saw off the remaining 15 overs without any further loss at their personal contribution of 14 and 13 runs as the hosts scored 35 for the loss of three wickets. Stuart Broad was the most lethal bowler for the tourists and claimed two wickets whereas James Anderson got one. New Zealand had secured an overall lead of 274 runs and an addition of 100-150 runs to the total with seven wickets still in hand can bring them to a match winning position.